The second, hardcover edition of Fountain Pens Past and Present, by Paul Erano is now available with personalized inscriptions at no extra charge. It is bigger, expanded to 288 pages with new articles, essays, charts, and strategies, and collector’s tips for getting the most out of your pen collecting activities. 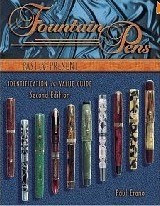 It contains hundreds of beautiful, new pictures of vintage and contemporary pens in full color with life-size photographs and updated values; a new section on custom pen makers; and a new chapter on the Esterbrook Pen Company.